MILAN, Italy – Amina Muaddi is the Creative Director of the shoe brand Oscar Tiye. She started the brand together with her business partner Irina Curutz. When I was in Milan last month I met her for lunch and we talked about her new project..
1. Tell us about your background and why you decided to create the brand Oscar Tiye? anymore and embark in this adventure with my best friend and now business partner Irina Curutz. 2. If you could collaborate with a designer who would it be? Oh wow that’s a tough one! There are a lot of designers that I like and admire but my all time favourite is Nicholas Ghesquière. But that would be more of a sit and watch the master/learning process rather than a collaboration. Other than that there are a lot of fresh, young, talented designers that I would collaborate with. 3. What has been your highlight so far at Oscar Tiye? We are a new brand so we experience a lot of “firsts” every day, I think that’s the beauty of it. The first time I saw our shoes on a style icon like Zoe Saldana was great, or the first time I saw them sold in a boutique I love. Recently we were chosen by Vogue Italia to present our collection during their event at the next Fashion Week so we are pretty excited about that too. 4. Who would you like to see wearing your shoes? I think seeing women wearing my shoes is the most gratifying feeling, whether they are famous or not. I know if they chose Oscar Tiye they are the feminine, chic, refined, cool and fun ladies I like. 5. Whats next for you and Oscar Tiye? I so am excited to present our Spring Summer 2014 collection in September in New York, Milan and Paris. As for me maybe going on a short vacation before the madness. 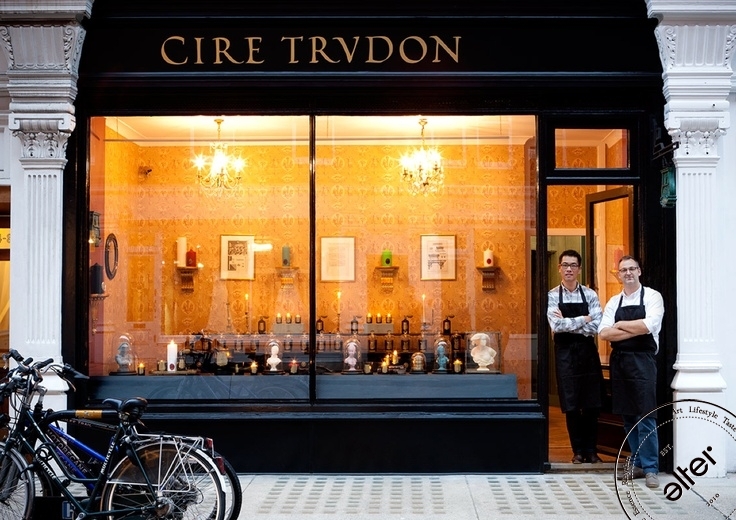 The legendary craftsmanship behind Cire Trudon candles—our newest obsession! 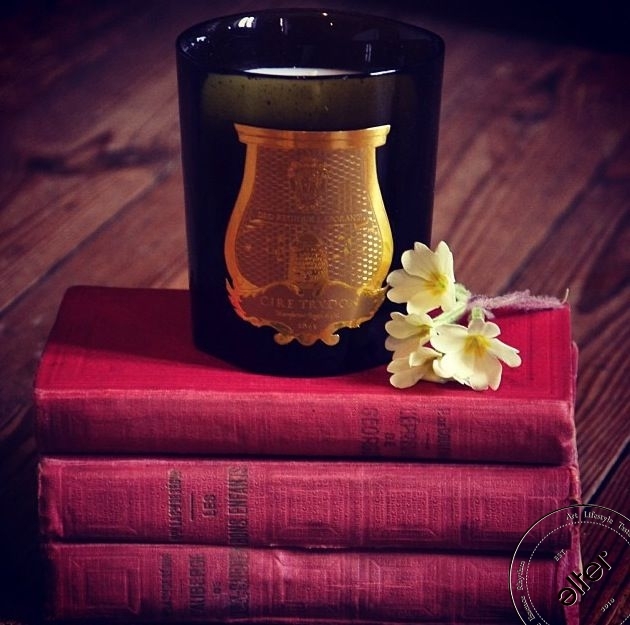 THE RICH AND ROYAL HERITAGE of French candle maker Cire Trudon is woven through with quintessential elements of Parisian history. The clean-burning white candles once lit the courts of Versailles in the time of Louis the XIV and lined the infamous boudoir of Marie Antoinette. A Trudon candle was the single gift given by Napoleon at the birth of his son. Revived in 2007, the Cire Trudon brand is staying true to its storied reputation for quality and creating candles you have to smell to believe. Cire Trudon GM, Julien Pruvost, fills us in on the ins and outs of the luxury brand’s inner workings. The Chalkboard Mag: Cire Trudone has such a fascinating history. Is it the traditions that come from Trudon’s long history that inspire the candle’s pure and all-natural ingredients? 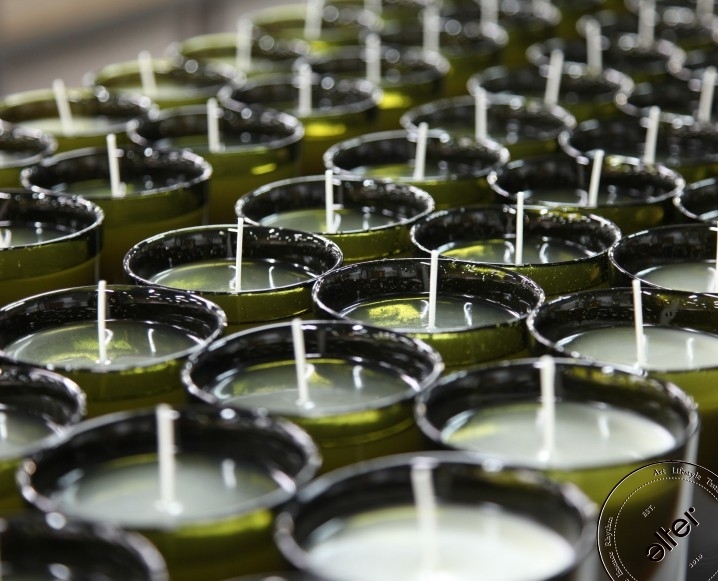 TCM: Tell us a little about the process that goes into making a Cire Trudone candle. JP: “All our ingredients come from traceable sources and are kept in solid form in a tempered warehouse to avoid any alteration and waste. TCM: Tell us a little about the inspiration behind some of CTs famed scents. The descriptions are quite fascinating. Which is the oldest? 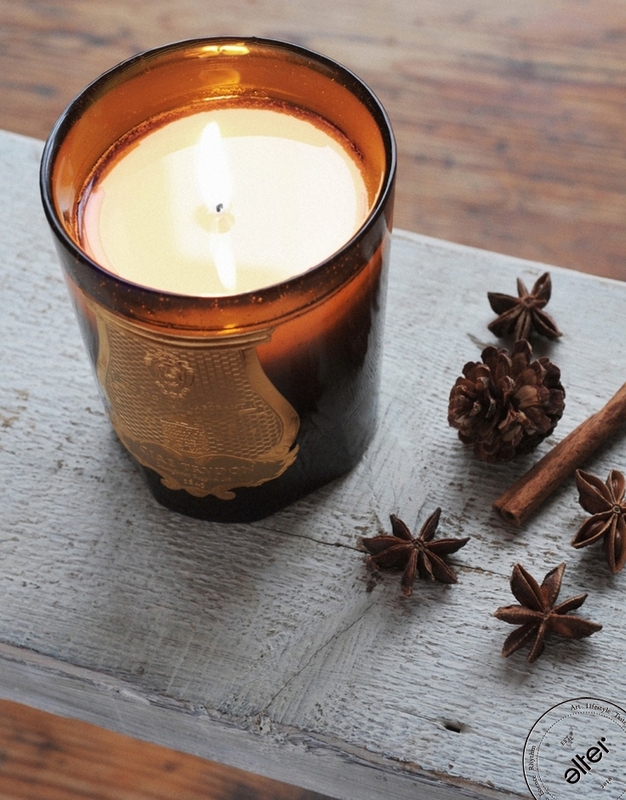 TCM: What are the 3 most popular candles and which is your favorite scent? Paris, London, Milan, New York: The old world playgrounds of Prada-clad editors have stayed in the fashion capitals for long enough. In an age of democratized fashion where style bloggers and Tumblr rub shoulders with Roitfelds, we’re demanding fresh blood and new territories. We want change, damnit, and as Twitter-reared youth, we want it now. So to begin, we’ve scoured stylish cities around the world for their brightest visionaries—designers making big waves in their countries that will undoubtedly reach our shores. Seoul-based Steve J. & Yoni P. are the quirky design duo behind the eponymous womenswear label. By injecting whimsy and funk into a high-end sensibility, they’ve arguably become the most celebrated design team in Seoul with a flagship store in the trendy Itaewon district titled, “Two Heads are Better Than One.” They’ve collaborated with movers and shakers like Jeff Koons as well as many influencial buyer's concept store including our very own ALTER Concept Store, they’re well on their way to global recognition. The two designers embody the spirit of their brand from Steve J.’s Harry Potter-esque glasses and trim moustache to Yoni P’s platinum blonde hair and coal-rimmed eyes. And as if that isn’t enough, they’re married in real life—a relationship that exudes jubilance and charm which reflects onto their collections. BULLETT: How did you meet at start the brand Steve J. & Yoni P.? YONI P: Actually we met in Korea while studying fashion design and then went to London to study together. I got my M.A. in womenswear from the London College of Fashion while Steve got his M.A. and B.A. in menswear from Central St. Martins. So by the time we started our brand, we had already been together for over ten years. What is the design process like with two designers? We don’t really separate our roles in the design process, but Steve does do more of the illustration while I focus more on concepts and design. Since we’ve been together [in a relationship] for so long, we know exactly what each other wants, so we’re pretty in sync all the time. What woman wears Steve J. & Yoni P.? Who would you like to see your designs on? We really love that a lot of Korean celebrities and K-Pop stars like singer Hyori Lee and actress Gyuri Kim have worn our clothes. What’s next for Steve J. & Yoni P.? For the past three seasons we’ve been showing at Concept Korea during New York Fashion Week and have been getting really good feedback from buyers and the press, so we definitely plan to keep showing in New York. By 2015, we hope to be established as a recognizable designer brand within the global market. In just a few brief years, Danish designer Malene Oddershede Bach has made her way into the London Fashion scene spotlight. Having earned herself a coveted place in Fashion Scout’s One to Watch London showcase back in 2011, Bach’s talents have been steadily gaining global recognition ever since. An admitted math nerd, Bach’s intelligent prints are similar in nature to the late abstract painter Wassily Kandinsky’s geometric forms. Prints such as a vibrant neon speckled pattern seen in the designer’s Autumn/Winter 2013 collection, are a highlight of her ready-to-wear women’s line. Aside from a sleek new collection of separates that pop in cobalt blue and bold reds, the Autumn season will also usher in a new phase in Bach’s career. The designer is moving into accessories, and from what we’ve seen of MOB by Malene Oddershede Bach, the line will receive a glowing reception from the fashion industry and shoppers alike. We’re already pining over the new collection’s leather handbags with metalware detailing! Hot on international style radars, we tracked down Bach to get her thoughts on the speed of her rising star, and what direction she sees it heading in. LET’S START FROM THE BEGINNING, TELL ME A BIT ABOUT YOUR BACKGROUND? I was born in Denmark and brought up on a farm. I lived a fairly isolated life, spending my spare time playing football and horse riding. At 19, after finishing school I decided to move to London for 6 months, as I was unsure as to what to study. Needless to say, months turned into years after falling in love with London, and later realizing I wanted to pursue a career in the creatives. SO FASHION BECAME A PART OF YOUR LIFE WHEN YOU MOVED TO LONDON, OR DID YOUR PASSION FOR IT ACTUALLY BEGIN BEFORE YOU OFFICIALLY BEGAN TO PURSUE IT AS A CAREER? I’m from the outskirts of a small town with only a few shops, so to prevent turning up in the same outfit as my friends, I early on starting rummaging around in the charity shops my Gran ran, to come up with more creative ways around that. When I played football, I was always known as the girl with the fishnet or teacher bag as my handbag. WITH SUCH A NATURAL KNACK FOR FASHION, YOU NEVER CONSIDERED IT AS A CAREER WHEN YOU WERE YOUNGER? I never thought about fashion as a career when I was a child. I had never met anyone going down that path being from a small town. I did lots if sewing when I was younger, but it wasn’t until after moving to London that it clicked. YES IT CERTAINLY HAS CLICKED! IN JUST A FEW SHORT YEARS, YOU’VE REALLY DEVELOPED YOUR CLOTHING LINE, AND NOW YOU’RE MOVING INTO ACCESSORIES, NO? It’s been really good so far, and for AW13 we’re launching our accessory line MOB by Malene Oddershede Bach, focused mainly around handbags. We tested some simple printed clutch bags the season before, but have always wanted to go down the route of accompanying the RTW collection with a proper handbag line. I am a bit of a perfectionist and don’t like to do anything halfhearted, so the bags were a natural route to go down, and we’ve received a great response for the first collection. It will be a line we’re looking to develop further for seasons to come. AND THERE ARE SHOES AS WELL I UNDERSTAND? We did a shoe collaboration with Gold Dot (Solestruck and Karmaloop US) creating shoes for the collection. We have done shoes for a couple of seasons now, and it is something we would love to develop, but still working in finding the right factories at the right quality and prices. IN TERMS OF YOUR GREATER DESIGN AESTHETIC, DO YOUR DANISH ROOTS FIND THEIR WAY INTO YOUR FASHION VISION? I am sure they do one way or another, but it’s a little hard for me to point out exactly how. Having grown up on a farm, I am a big fan of nature and this is often a starting point for the prints in the collection. Recently they have however taken a slight more scientific route as we have collaborated with professors and scientists at the UCL developing, growing and photographing cells, of which the result we have manipulated in to the final designs. MAKES SENSE THAT YOUR PRINTS READ SO INTELLECTUAL. SO YOU’RE INTO SCIENCE THEN I TAKE IT? Had I not found fashion, I would most likely have studied Maths; I like the scientific work behind it, and that it is not just a picture of some flower that I copied off some book. AS SO MANY OTHER PEOPLE DO, HA. WHY HAVE YOUR CHOSEN LONDON AS YOUR HOME BASE? I made London my home before starting doing fashion. I fell in love with it on my first visit (family holiday), and for me moving back to Denmark would be like moving to any other country to base my business, as I would not know my whereabouts within the industry like I do in London. IT’S A VIBRANT CITY, FULL OF CREATIVITY. I find the feeling of always having the option of going to a gig, exhibition or any other happening very attractive, even though I rarely have the time to make use of it. 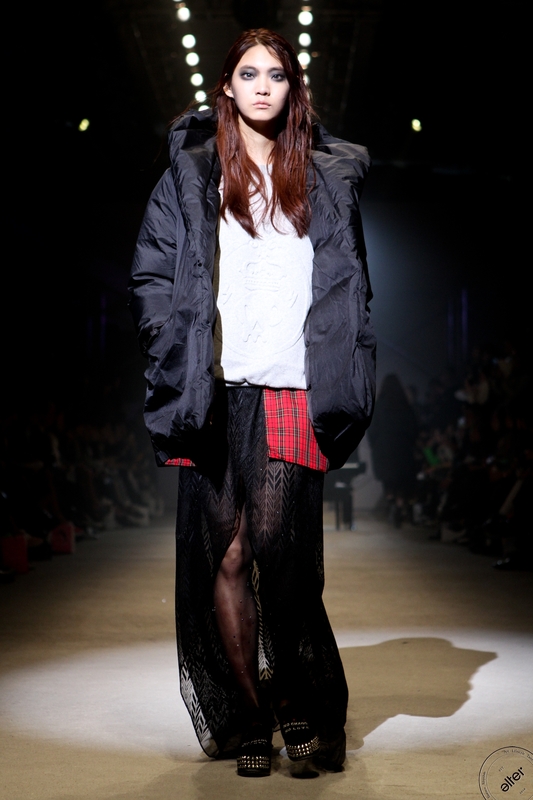 THOUGH YOU SAY YOU DON’T GET A CHANCE TO GO OUT MUCH, WHAT WOULD YOU SAY IS YOUR BIGGEST INFLUENCE OUTSIDE OF FASHION? Nature, science, and different techniques used to develop arts and crafts. I like objects/matters that have evolved from processes that might not be possible to the human eye. AND HOW DOES THAT RELATE TO YOUR LATEST COLLECTION, WHAT YOUR INSPIRATION THIS SEASON? The print for AW13 was created via a collaboration with a professor at the UCL. The print is normally the starting point and the rest of the fabrics and collection itself then evolves around this. I looked into a lot of techniques and cuts that were used in the past by looking at vintage/second hand clothes, and took bits and pieces, and then made it my own. DO YOU OFTEN LOOK TO THE PAST WHEN SEEKING INSPIRATION? I am a strong believer that everything has been done before, and it is more of a matter of doing a garment in a new way. Standard shirt with a cut out at the chest for example. IF YOU COULD PICK ANYONE (DEAD OR ALIVE) TO WEAR A PIECE FROM YOUR COLLECTIONS, WHO WOULD IT BE AND WHICH PIECE WOULD YOU HAVE THEM WEAR? My mother. She is a very difficult customer. However, season upon season she is getting more and more in to it and has actually ordered both shirts and handbags from the collections. Even my grandmother wants one of the bags. That’s something I thought would never happen, but am over the moon that I have succeeded in creating something that can be used outside our standard target audience, reaching women of all ages. THAT’S A FEAT! ANY DESIGNERS OUT THERE THAT HAVE INSPIRED YOU? I don’t gain inspiration from other designers work. I think it is important to know what is going on around you, but still important to leave your design process as organic as possible without any influences from specific designers. I would hate if my designs looks like another designer, and this is something I’m very conscious about throughout the design process. I CAN TELL FROM THE DISTINCT STYLE OF YOUR DESIGNS. SPEAKING OF WHICH, CAN YOU TALK A BIT ABOUT YOUR TAKE ON THE SUIT? Our suits started out as a printed suits, however we are now doing both plain and printed suits based on the same cut. The printed suits from AW has proven very popular. It’s a fitted tailored pant with signature press fold down the front and back of the leg with a generous sized blazer that allows for movement and jumpers to be worn alongside it. All made in a printed silk mix finished with a reflective finish, which is the shine. LOVE THAT PIECE, IT’S VERSATILE. I find it that a printed suit can be a massive statement piece, but also split down and styled with say plain trousers. FINAL QUESTION: WHAT’S SOMETHING WE CAN LOOK FORWARD TO FROM MALENE ODDERSHEDE BACH? Hopefully there will be a show on the cards for SS14. Apart from that, further development on the bags and perhaps even a new print technique that will take the prints down a slightly different route! As anyone worth their sartorial salt will know, Mother of Pearl is not only a jewellery component favoured by the middle aged, it’s also the name of an ultra cool fashion brand renowned for its unique take on haute sport chic. Founded by Maia Norman (AKA Mrs Damien Hirst), Mother of Pearl boasts major style and art credentials thanks to it’s talent for combining high fashion with wearability and seasonal artist collaborations. 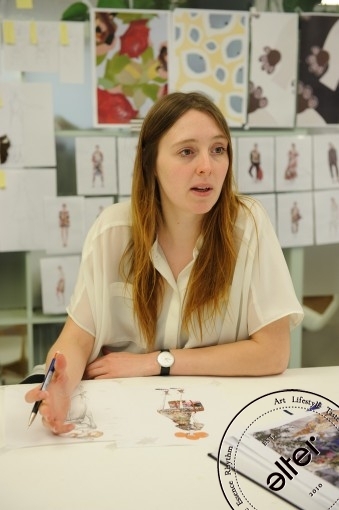 LPA: What was your first job in fashion? And how did you get from there to your current position? Amy: My first full time job in the industry was for Mother of Pearl. I have been working here since I graduated and five seasons ago took over as head of design. LPA: You’re now in your fifth season as Head Designer at Mother of Pearl. Do you feel the brands aesthetic has changed or developed at all since you came on board? Amy: Having been with Mother of Pearl for a long while, I have seen the transformations of the brand and was able to understand Maia’s direction. When taking over as head of design I had a real grasp of where it should be which enabled me to move the design on to where it is now. I feel the brand has found its aesthetic and concept that is proving to be a success! LPA: Each season MOP collaborates with an acclaimed artist to produce the prints for the collection. How do you choose which artist to work with? Amy: Maia picks the initial artists and then we sit down, look at the options and decide whom we both feel would work for the coming season. It’s a great process as we both can look at the work from different viewpoints, Maia is submerged in the art world and has a great knowledge for the artists and their work and I will look at the translation of the work to print, fabrics and my inspiration for the collection which makes for a perfect combination in the initial design phase. LPA: What do you think of the relationship between art and fashion? In your opinion can, or should, fashion be considered a form of art? Amy: Having worked closely with both fashion art art, it always surprises me how little each industry knows of the other which instantly shows how different they are. However, of course the have common links, they are both visual, creative and in cases conceptual. They both derive from a set of first hand ideas and creative inspirations and both can be looked at from both a creative viewpoint and more commercial viewpoints. At Mother of Pearl we are creating a concept, an aesthetic but mostly when I am designing for the brand I am always thinking about the final piece and would therefore relate it very strongly to product design as well as an art form, but perhaps, not art! LPA: Mother of Pearl has always been renowned for combining sportswear with high fashion. Now sports luxe is suddenly being feted as one of this seasons “biggest trends”! Do you think that the fact athletic style is everywhere from Victoria Beckham to Topshop will have any impact on MOP? Amy: I am sure that the new trend of sports luxe hitting the season’s top trends will have an impact, and help with the brands growth in the public eye. What’s great about Mother of Pearl is that with our seasonal collaboration with artists we can reinvent what we do with each collection so even if the sports trend moves on, Mother of Pearl will continue creating something new and evolving each season.